I was raised in Oregon picking (and eating) blueberries every summer with enough to freeze to last all winter. And I would just got get a Tupperware and eat them frozen. They were my candy. 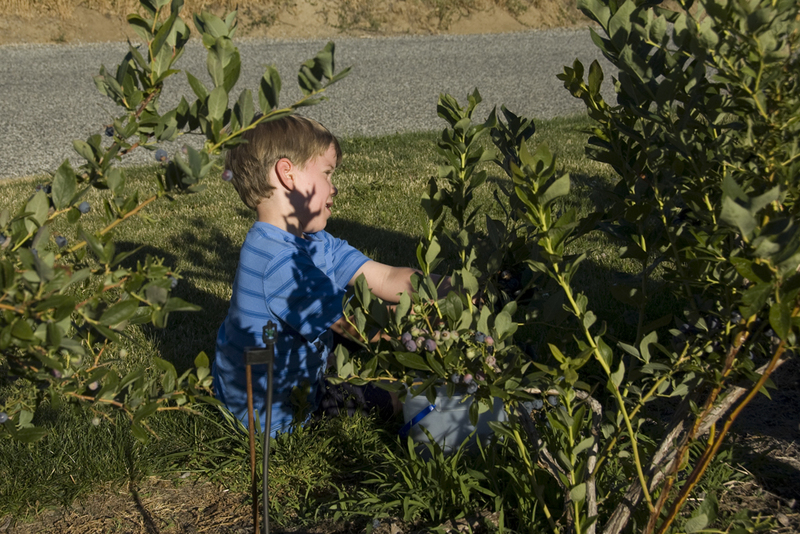 So imagine my frustration all these years when my parents moved us to arid Eastern Washington and there were no blueberries to be picked and the ones in the store were an expensive tasteless option. Cory helped pick, maybe half a bucket full, most of which he ate! Luckily I married a guy whose parents live in blueberry country Oregon so for the past few years I've stocked up every summer when we go visit. Not enough to last the whole year, but enough to help me survive. 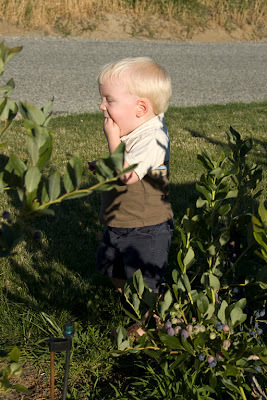 Then a couple years ago I heard that there might be a blueberry farm locally. I wasn't sure I believed it and since I had my Oregon supply I didn't look too hard. This year my mom had a flyer on her counter so I started calling around. 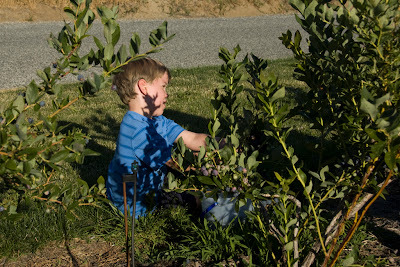 Saturday night... we picked blueberries half an hour from our house! 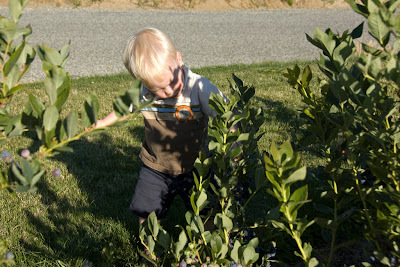 The bushes are still babies (ie, you have to sit on the ground to pick) but they were loaded. And unfortunately not much cheaper than the store bought ones. But oh, the flavor! And the actually getting to pick them myself! By the handful and stealing from our buckets! We came home with 25 pounds of berries (in just over an hour, that's got to be a record!) and froze 3/4 of them. We've been eating ourselves sick and today I made my first ever pie. * How perfect for me! It was divine and now I'm in heaven with my own secret blueberry stash! *Recipe complements of Short Stop, crust too! God FILLED you with sweet, luscious blueberries...a pretty neat spiritual picture, actually! 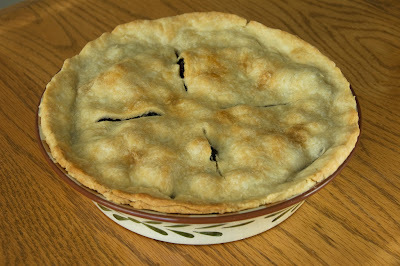 beautiful pie, good for you! Precious photos of those little blueberry eaters! I am a saskatoon girl. Apparently they are a western thing, as I learned when I lived in Ontario and no one there had ever heard of them! Upon moving back out west, I picked and made jelly and sent it (via snail-mail) to my best friend from Ontario. She and her kids ate the whole jar in one sitting! Do you have saskatoons down there?